Rona Fairhead’s record should disqualify her from public office, but the Tories have found her two. Why? Rona Fairhead was well-known to be a Conservative when she was appointed as chair of the BBC Trust. I commented on her political persuasion here and here. It turns out she was also chair of HSBC’s audit committee when the bank was mired in tax avoidance and money laundering scandals. It also transpires that George Osborne, as Chancellor of the Exchequer, warned the US government not to press criminal charges against HSBC for allowing terrorists and drug dealers to launder millions of dollars. One has to question whether Mr Osborne would have – if he had been editing the Evening Standard at the time – discouraged reporters there from writing about HSBC, as happened at the Daily Telegraph. Ah, but of course the Torygraph had recently benefited from a stonkingly huge HSBC loan – £250 million. That kind of money can seal a lot of laptops. But then again, it was alleged earlier this year that HSBC laundered £5 million into Conservative Party hands, in advance of the 2010 general election. Would that be enough to buy George Osborne’s loyalty? I leave that to your own judgement. Meanwhile, Ms Fairhead is now the Tory minister in charge of trade and export promotion, after being rewarded with a peerage for… well, for being involved in lots of scandals, apparently. 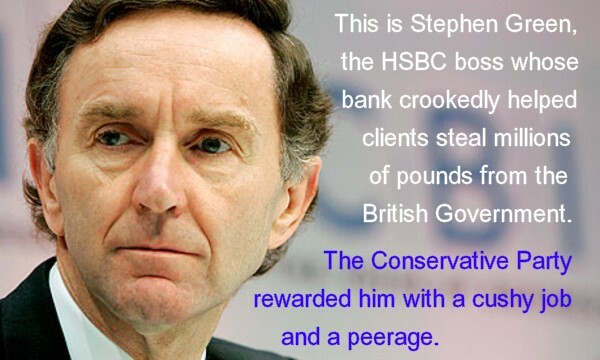 Tories have ‘form’ in this respect – former HSBC chairman Stephen Green quit his job (after the bank was involved in the scandals listed above) to become a Tory peer and minister of state for trade and investment in 2011. Stephen Green: With people like this in charge of banks – and then going on to important roles in Conservative-led governments, can either the banks or the government be trusted to do what’s right for UK citizens? 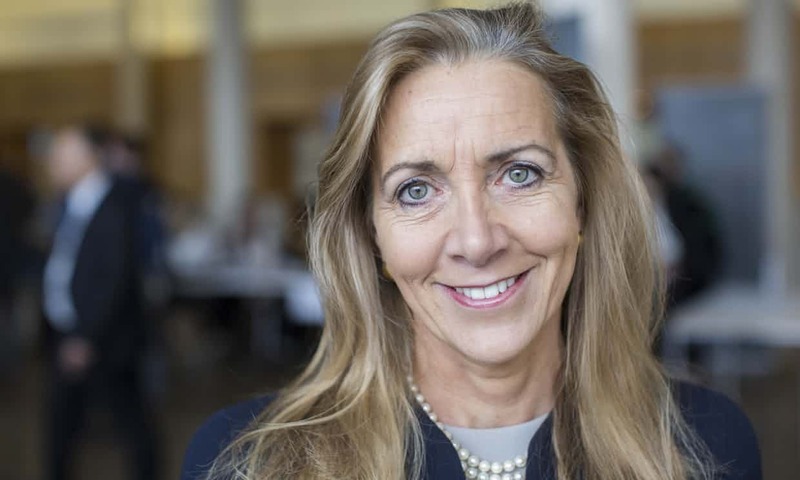 The former chair of the BBC Trust Rona Fairhead has been appointed as an international trade minister with a life peerage, Downing Street has announced. Fairhead will replace Mark Price, the former Waitrose managing director who quit after a year as trade policy minister. The MP Greg Hands has taken over the policy role, and Fairhead’s title will be minister for trade and export promotion. Fairhead was the chief executive of the Financial Times Group before taking on the BBC role, from which she resigned after Theresa May indicated that she would have to reapply for the job to which she had been appointed by David Cameron. Fairhead was the chair of HSBC’s audit committee when the bank admitted to “past compliance and control failures” in the group, after it was mired in a tax avoidance row uncovered by the Guardian’s HSBC files investigation. Rona Fairhead, new Minister for International Trade was former HSBC chair of audit. Rona Fairhead was head of risk at HSBC in the US at the time they were laundering drug and terrorist money. She now has a peerage. Rona Fairhead, who ran the BBC's governing body until recently, given a peerage and made a minister in the Conservative government. Righto. It seems clear the Conservative government has a problem understanding the concept of trustworthiness. A person who has been involved with a business that has regularly and unrepentantly engaged in criminal activities should not have been made chair of the BBC Trust, as David Cameron did. It casts doubt on the reasons for the appointment and raises questions about interference with BBC current affairs coverage. Theresa May was right to demand that Ms Fairhead re-apply for the job, under those circumstances. But now she has shown a colossal error of judgement in giving the same person a peerage and ministerial appointment. Why? One has to ask what is behind this decision. Whatever the answer to that question, we can be sure that Ms Fairhead’s appearance in the House of Lords can only undermine what little faith is left in the Conservatives as a party of government. The Tories seem to have a bent for identifying dishonesty and corruption… and rewarding those who exemplify it! There is no honour comes to mind!